1864. "Nashville, Tennessee. Rail yard and depot with locomotives." Wet-plate glass negative by George N. Barnard. View full size. Another view here. Submitted by ckc on Tue, 10/09/2012 - 5:17pm. The State capitol building in the upper right orients you pretty well as to where Bernard took the Photo. Although the depot buildings are long gone, the RR yard is still there, although probably not for very long--the neighborhood is getting very posh now and CSX Railroad is sitting on valuable real estate. Submitted by poikaa on Thu, 06/21/2012 - 2:24am. I am sure the meaning of USMRR means United States Military Rail Road. 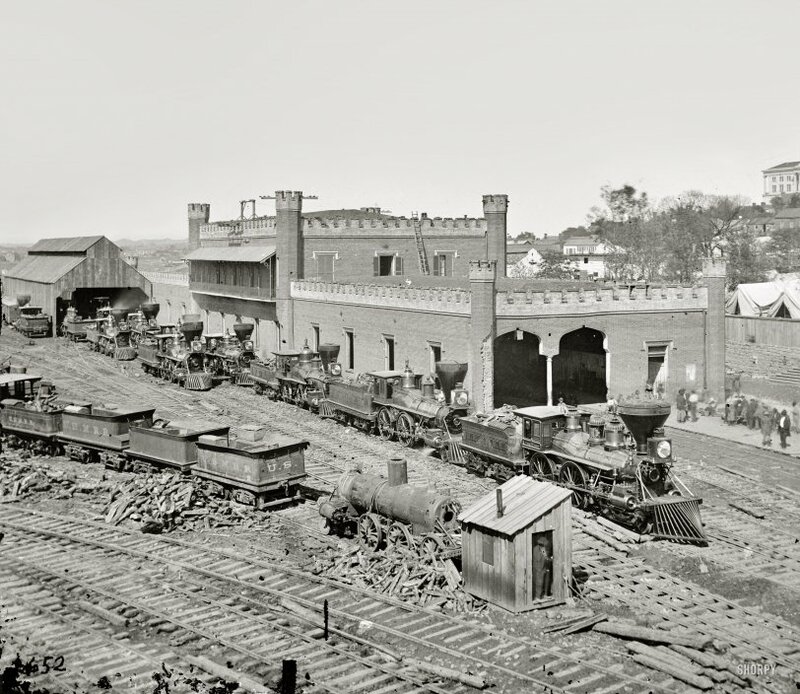 Rolling stock and engines were valuable for transportation during the Civil War. Far faster than horses capable of 40 to 50 MPH for long periods, the US government during this time depended on rail transportation. Nashville was a hub for the South plus it's Cumberland River traffic, hence the gathering of so much here. Submitted by Slidevalve on Thu, 06/23/2011 - 9:06pm. Please note the external journals on the pony truck of the lead engine nearest the camera. That's something you did not normally see on steam engines until the the twentieth century and then not until the "twenties" and then it was unusual. C&NW 4-8-4s had 'em. A few others too. Interesting! In 1864. Submitted by Anonymous Tipster on Wed, 07/29/2009 - 1:28pm. I looked at the full-size picture for quite a while before I realized that there are two workers sitting in front of the woodpile. Submitted by Anonymous Tipster on Tue, 07/28/2009 - 12:26pm. >> As a Canadian I must ask what USMRR stands for. Submitted by delworthio on Mon, 07/27/2009 - 9:42am. This depot was on McLemore Street. This Google view is pretty close. Those might be the same bricks in the 1864 photo. Submitted by willc on Fri, 07/24/2009 - 12:35am. The timbers on the the crenelated corner towers (chimneys?) do look like rail ties, but they have been fitted with prong-like pieces of wood and ceramic insulators for telegraph lines. Some of the lines themselves can be seen running from the insulators on the front corner tower to the insulators on the scaffolding at the center back roof parapet, and to another timber with three insulators on the tower at the far back corner of the building. All of this looks like an ad hoc arrangement, perhaps the result of a wartime need for more telegraph lines than were needed for a peacetime rail depot, or to quickly replace lines that were downed when the brickwork was damaged. Submitted by Anonymous Tipster on Thu, 07/23/2009 - 8:50pm. Okay, I've got to ask. What are those things sticking out of the "turrets"? Submitted by Brent on Thu, 07/23/2009 - 3:11pm. The "crenelated" appearance could easily be a Moorish or Spanish-Moorish influence. They weren't just "English castle" style but really pretty universal. Submitted by Photobay on Thu, 07/23/2009 - 2:39pm. What an incredible photo, and could be of great use to model railroaders doing that era. The wood clutter would be almost impossible to manage due to the amount of engines and all burning wood....I guess there was no forest management in those days either. As a Canadian I must ask what USMRR stands for. Submitted by Wild Bill on Thu, 07/23/2009 - 1:28pm. The building that you see in the upper right hand corner of the photo is the state capital. It was completed only a few years before the beginning of the war in 1861. It still stands today. Nashville fell to Union forces without a fight in February of 1862. However, in the fall of 1864, in a last ditch effort to relieve the pressure on General Lee's forces in Virginia, confederate president Jefferson Davis ordered confederate General Hood to disengage from following Sherman to the sea and attack Nashville and after its capture move into Kentucky and then Ohio in hopes of the Union suing for peace. So, on December 15th and 16th of 1864 Union forces came out of their dug in positions and attacked Hood who had over the two proceeding weeks dug in and waited for the Union forces of General Thomas. Then over those two days Union forces soundly defeated the confederate forces. Submitted by Anonymous Tipster on Thu, 07/23/2009 - 1:15pm. This shot was taken where the bulk of downtown Nashville now resides. You can see the state capital off to the right. Even today Nashville is a pretty small city. Growing up not far from there, it always amazed me that such a smallish city could have such clout in the world of country music. Submitted by ShannonG on Thu, 07/23/2009 - 10:52am. Those huge chunks of wood make the engines look tiny, even though I know they aren't. I also like the ghostly image of the now long-dead man in the shack. It's a rare treat to look back 100+ years into the past and I'm still amazed at the clarity of these old photographs. Submitted by Jim C. on Thu, 07/23/2009 - 10:24am. Great RR view...but I kept looking for Buster Keaton peeking out of one of the locomotive cabs, or sitting on a connecting rod kissing his girlfriend! Submitted by Anonymous Tipster on Thu, 07/23/2009 - 10:05am. What bizarre architecture! That sagging entry portal is being held up with that one flimsy pole? And the archways look Persian or Turkish or "Arabian" while the turrets look like an English castle. The whole thing looks like it's going to fall apart any minute. I'm afraid Nashville here looks like Atlanta post Sherman! Submitted by Mr Mel on Thu, 07/23/2009 - 8:21am. is not eligible for the Good Housekeeping Seal of Approval.